A One Week FDP on "Simulation And Emulation Software" Organised by Dept. of ECE. A 20 Days Training Program on Auto CAD and Pro-E Conducting by Dept of Mechanical and Automobile Engineering. A One Day workshop on Automotive Engines Conducting by Dept of Mechanical Engineering. A 7 Days workshop on Bigdata Analytics Conducting by Dept of Computer Science & Engineering . A One Day workshop on Internet of Things on Security and Privacy Challenges Conducting by Dept of Computer Science & Engineering . A One Day workshop on Python Programming Fundamentals Conducting by Dept of Computer Science & Engineering . A One Day workshop on IOT and its Applications in the field of Engineering Conducting by Dept of Electrical & Electronics Engineering. "SRUJANA-2K17" 7th National Level Technical Symposium. Faculty Development Program on "Emotions and Human Behavior" will be conduct at PACE by Staff Development Committee. Indian Navy Campus Recruitment under University Entry Scheme-17 is scheduled at PACE. Engineers Day Celebrations @ PACE. Freshers Day Celebrations @ PACE. A Guest lecture on "Bigdata Analytics With R" for final year CSE & IT students from 10 Am to 5 PM by Dr. V. Srinivasa Rao. 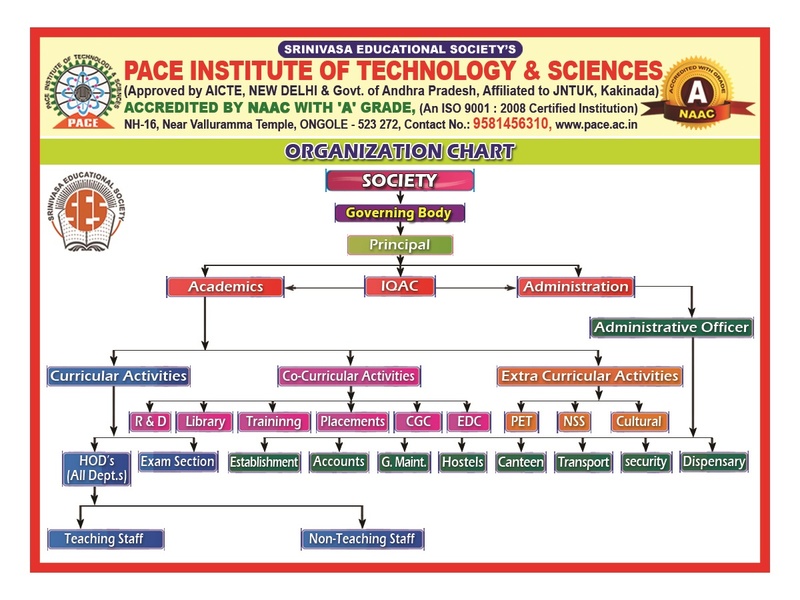 Scope eKnowledge Services Pool Campus Drive for B.Tech all branches. A 7 Day National Level Work Shop on "Youth Volunteering For Construction Work - Gandhi Philosophy" jointly organised by PACE, Gandhi Smriti, and Darshan Samiti, Ministry of Culture, Govt. of India. "PACE-2016" Alumni Meet held @ PACE. 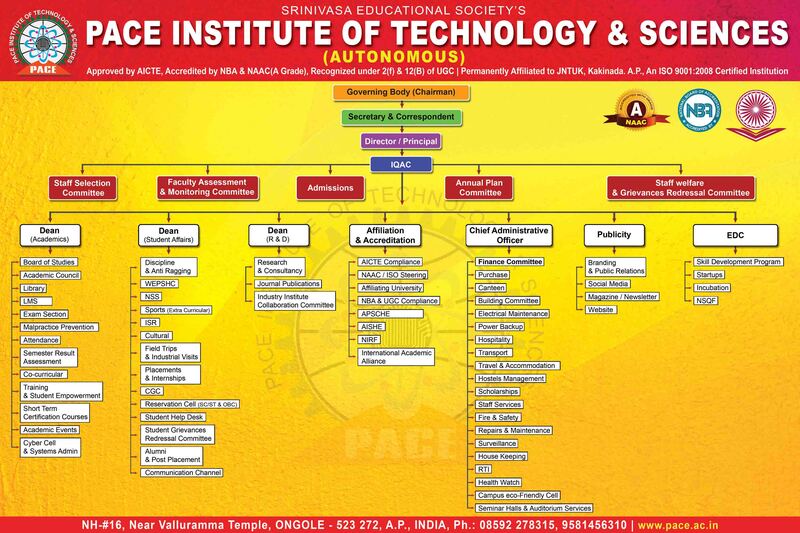 HCL Technologies Pool Campus Drive at PACE for B.Tech 2013, 2014, 2015, & 2016 Batches with 60% aggregate. A Guest Lecture On "Applications of Geotechnical Engineering" by "Dr. K. Nagendra Prasad", Professor of Civil Engineering, SVU, Tirupathi. Faculty Development Program On "Research & Development" by "Dr. K. Nagendra Prasad", Professor of Civil Engineering, SVU, Tirupathi. "International Women's Day" Celebrations by "Kalyani Chebrolu", Civil & Criminal Lawyer. Awareness Programme on " IBM Bluemix Cloud Computing"
Entrepreneurship Programme by "ISLE Chairmen D.Krishna Sastry"
Final Year Civil Students are participated in Land Survey Collaborated with Govt Surveyors organized by Govt. Two Day National Level workshop on Interactive Ethical Hacking-Cyber Security "organized by CSE&IT and Association with CSI"
KTM Bikes Stunt show organized at "PACE College"
The Management,Faculty and Students of College joined with the JNTU KAKINADA Special NSS camp to conducted "Tree plantation Programme"
PACE Conducted "Blood donation camp." The Management,Faculty and Students of College joined with the nation to pay tribute to "Dr.APJ ABDUL KALAM"
KTree Computer Solutions Pool Campus Drive "For B.Tech(CSE,IT),MCA & MBA"
ICRTIET-2015 International Conference on "Recent Trends & Innovations in Engineering & Technology" By PACE & IRD India. A Three-Day Training Program on "WINDOWS MOBILE APP DEVELOPMENT" By Microsoft Team. SRUJANA-2K15::5th National Level Technical Symposium @ PACE. 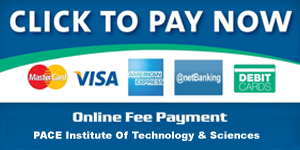 DV Tech Services On Campus Drive for B.Tech CS, IT, ECE, EEE & Mech. Serco On Campus Drive for B.Tech all Branches and MBA. Mphasis Campus Drive for B.Tech CSE, IT, ECE,EEE & Mech & MBA 2014 & 2015 passed out Students. LG Soft Campus Drive for B.Tech CSE, IT & ECE Students. EHPL India On Campus Drive for B.Tech Final Year Civil & Mechanical students.